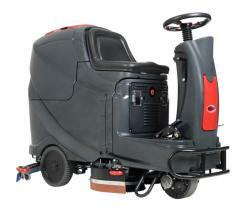 The AS710R, medium sized ride-on scrubber dryer is the perfect solution for scrubbing and drying in heavy-trafic areas. The AS710R is designed for daily indoor cleaning of railway stations, parking areas, shopping malls, exhibition centres, schools, hotels, public buildings and other commercial environments. Think affordable and easy to use. Think Viper. The AS710R is ideal for cleaning all kinds of floors including tiles, vinyl, sealed wood, marble and concrete. The AS710R is compact, robust and easy to use.